Our modern first floor, one bedroom apartment, sleeps 4 very comfortably, but ideal for 2 persons. One large double bed in the bedroom and 2 double sofa beds in the sitting room as well as the possibility to sleep on the covered terrace on either of the two permanent day beds. It also has a large open terrace.The apartment and the terraces have direct sea views across to Ibiza and beautiful evening sunsets. It is in an exclusive 3 floor block, with a lift, in La Sabina, Formentera's palm lined port and marina. It is set back from the main promenade with a large sailing lake and beach outside the rear of the building. The nearest beaches are on the lake at the rear of the building and also 5 minutes walk past the marina. It is also possible to swim directly in front of the apartment. There are buses nearby to all parts of the island. Cars and bikes to hire in the port. There is a friendly bustle in the evenings with the people off the boats, designer market stalls throughout June - September as well as small artisan shops. There are both quality and reasonable priced restaurants and bars along the front of the marina and beside the lake. This creates an interesting and fun place to amble through in the evenings. We are an english family who have owned the apartment since 1996 and have enjoyed anything up to thrice annual holidays here ever since. It is a happy and safe environment for all ages. We decided to buy a property here as we had a succession of disatisfactory european beach holidays which fell far short of what we experience in Formentera. The weather is often warm and sunny throughout the winter and has a lower rainfall than Ibiza (its neighbour) due to its small and low landmass. The water is clear, the beaches sandy and white and the locals are friendly and helpful. We enjoy the cycling and almost never hire a car. It takes on average 7 hours door to door travel. We are within easy access of the ferries so we dont need to hire a taxi or car to reach our property. We can easily hire a bicycle/vehicle, visit cafes, shops, enjoy the comings and goings of the yachts and we are near all the best beaches on the illetes peninsula. 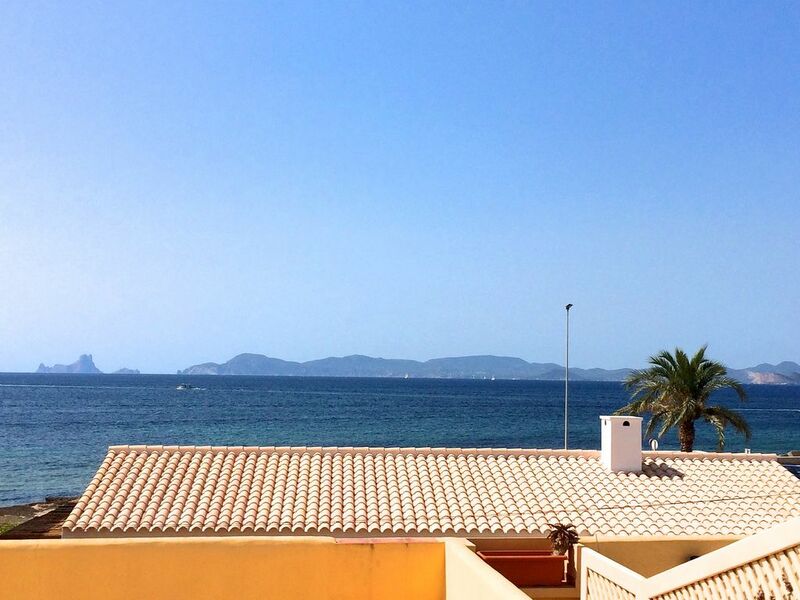 WE also have the best view on the island directly from our terrace and apartment. The property is simple to manage, modern, comfortable and clean. The outdoor terraces are great for relaxing, sunbathing, eating, drinking and watching the world go by! In July and August there are many boats coming and going in the marina. There are tasteful market stalls alongside the marina morning and evening adding to the throng and happy holiday environment. Pop up bars extend the choice of where to relax and enjoy the warm summer nights. Modern with large shower cubicle, basin. Separate wc. Shower towels supplied but NOT beach towels. Sitting room with 2x double sofa beds, coffee table, shelving, storage. Kitchen open plan to sitting room. Dining and outside lounge area on covered terrace directly accessed from the sitting room with seaview, sunsets over Vedra rock, and Ibiza. Very well equipped for cooking. Eating on the terrace while the sun is setting. Plenty of crockery and cutlery. Electric hand liquidizer. Coffee pot. Tea pot. Electric ceramic hob, small grill/oven, fridge/freezer, electric kettle. Well equipped with utensils, crockery, pans for every day cooking. Table and chairs on the covered terrace with perfect view of the evening sun setting. Games, bat and ball beach game. Bowls. Various masks/snorkels. Not supplied by us but very easy to rent. Covered terrace like an extra room with 2 beds, table and chairs and chair hammock. Large open terrace with fold up sun beds available. Tennis courts available in the local town of San Francisco to book. Good access from ferries. New lift, wide corridors. Ceramic floors in apartment and corridors. Notes on accommodation: Easy access from ferries, no need for a car. Cafes, shops, summer markets, marina an amble away. Easy bikehire. The sea water lake behind is beautifully warm with shallow water and sandy beach. Many sandy sea beaches 10 minutes walk or 5 minute cycle ride away. Safe cycling away from the roads. However we can not take any responsibility for accidents that may occur. Outside: 2 day beds, hammock chair, dining table and 4 chairs on covered roof terrace, sun canopy with three steps down to large open, private terrace, 2 folding sun loungers. Cleaning / Towels / Linen / Maid service: Shower towels and linen included, changed weekly. Extra cleaning service if requested. Beach towels not included. Other: Covered and private terrace seating/dining area leading down three steps to large open terrace. All uninterrupted panoramic sea view to Ibiza and sunsets with picturesque marina to the right hand side looking from the terrace. Beautiful view from the apartment. Apartment is cosy and homely. It is well equipped with furniture, kitchen equipment, linen etc. Bed is very comfy. Nice and clean too. A lovely well equipped apartment with huge balcony and terrace although no sun loungers on terrace available. A good location with plenty of bars and restaurants around the marina for the evenings or to hire bicycles and be on a beach within 10 minutes for daytime. This appartment suited us perfectly. It was very spacious for two people, had a fantastic outlook, was well furnished and maintained and was near to all the places we wanted to visit and activities we wanted to do. The appartment is on the second floor, but there is a lift if there is a problem with climbing stairs. The appartments have a secure entry system and all the public areas are cleaned daily. It is close to the ferries, shops, bike hire, many cafes and restaturants. The position of the terrace was ideal for all our meals, looking out to the sea and to the Ibiza. It was quiet and very well sound-proofed. We cannot praise it more highly and would really like to return. We would certainly recommned the the appartment to friends and family. As for eating, it was our third visit to La Savina, and we have tried most of the restaurants. This year we favoured Cafe del Lago, which is very near to the appartment. They cooked the most delicious pasta dishes, which I would reliably compare to those of Jamie Oliver's restaurants. They are reasonably priced and have excellent Spanish wines. All the small cafes sell good coffee. The bike rental place we would suggest to use is Formotors. We used the branch in the main road opposite the Hotel Savina, run by a very helpful girl called Andrea. Minor problems with both our bikes were fixed very promptly. We loved the beaches, especially the stretch on the island of Espalmador - reached by boat or walking from the tip of Les Illetes when the tide is suitable. The sea at both those beaches is warm and calm and a beautiful turquoise blue. Previously we have stayed at a small hotel nearby but we much preferred our recent holiday in this appartment. Do go! We have brought our children here from a very early age and all love the island. The freedom, the cycling, the beautiful turquoise water and long sandy beaches. Our apartment is like home to all of us and enjoy hearing other people having as much pleasure as we do when we visit. All my children bring their friends here now, all of whom love the introduction to the very unique pace and empathy for fun and freedom. I would say the island is fun for all ages and especially for those who delight in a slower pace of life. Propietaria atenta en todo momento a nuestras necesidades. Agradable. Estancia maravillosa. Excelentes vistas y muy bien situado para hacer salidas a otras partes de la isla. El único inconveniente es que no hay lavadora y tienes que llevar la ropa a la lavandería o lavar a mano. Los juegos de toallas son insuficientes (solo tienes una toalla por persona y nosotros estuvimos 12 días !!). Quitando ese pequeño inconveniente la estancia ha sido muy agradable. El apartamento estaba limpio y ha cumplido las expectativas que mostraba el anuncio. Sorry about the towels. There should have been 2 each, one shower towel and one hand towel which were then changed after 6 days. The reason I don’t have a washing machine is because the excess water consumption it needs to do a wash and many people will put one item in and think it is ok to use so much water! I am glad everything else was good for you. We enjoyed having you to stay. Excellent to read your positive review, thank you! Sea, 20 paces in front of apartment with sea water lake 20 paces behind the apartment. Port 40 paces to the side. Long sandy beaches as near as 10 minute walk, with many more to choose from and no further than 20 minute cycle ride away, with many off road cycle tracks. Fly to Ibiza airport and take 10 minute taxi ride to port where there are regular ferry services to Formentera. These take approximately 25-45 minutes. Off season last ferries are approximately 20.30hrs. July and August last ferries 21.30 to be sure but please check their websites. Trasmapi.com and medpitiusa.net. Advisable to choose early flights to allow for any delays to be sure. Nearest town is the capital called San Francisco. Five minutes by bus or 15/20 mins by bicycle. Lovely shops and 'hippy' market stalls. Art galleries, cafe society and picturesque square where regular jazz,rock concerts and similar take place. Also new astroturf tennis courts where tournaments are organized. La Mola the other end of the island (12 miles) and up a steep escarpment with beautiful views of the island and bi-weekly hippy market and gathering place for musicians and street theatre. In La Sabina there are bank cash points, internet cafe, restaurants, bars, 3 supermarkets near the port, and also temporary stalls selling a huge variety of wares set up twice daily during the peak season. Visiting yachts in the small marina beside the port all add to the happy holiday hustle for the evening amble to find and watch the world go by. Bicycles, cars and small motorbikes easy to hire on arrival, by the day or week. Booking Notes: A non-refundable deposit of 25% is payable at the time of booking with the balance due 8 weeks before departure. A refundable deposit of £100 is required when the balance cheque is paid. This will be refunded upon receipt of a report of no damage to the apartment and being left in a reasonable state. Bins emptied and linen stripped from beds. Prices are inclusive of electricity, water, bed linen and shower towels. NOT beach towels. Prices are for 2 persons. £50 per extra person up to 2 extra per week. No more than 4 persons staying at one time. Changeover Day: Changeover day flexible. Arrival time 4 pm departure time 10 am. These may be flexible if we do not have successive bookings. Luggage can mostly be accommodated if you arrive early. Prior arrangement necessary. Notes on prices: 10 day stays are possible and extra days paid incrementally. Prices are for 2 persons. £50 per person extra per week.